Taie is a local convenience store that is only in Nemuro. It is famous for “Yakitori Bento”, cooked right in front of customers in the store. 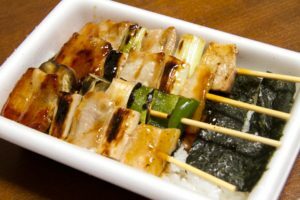 Although “Yakitori” itself literally means grilled chicken, grilled and dressed pork is used for “Yakitori Bento” instead. Around this region, “Yakitori” basically means any kind of meat on a skewer. 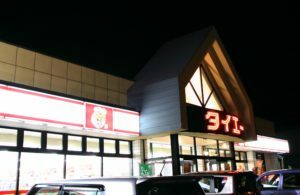 There are three “Taie” stores in Nemuro city. The Taie in Nishihama is especially easy to find due to its location along a main road. It has a lot of room to shop and eat inside. You can eat Nemuro style food in this shop when you are short of time to go to other restaurants. 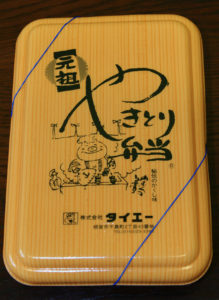 It also has “Shikaniku Bento (deer meat lunch box)”, freshly baked bread, and side dishes. Taie stores are open 24 hours a day, so they are good if you have an early departure or late check-in.